For the last 5 months my studio has been completely solvent free! I didn't know how easy it would be to make the switch! For anyone that paints alla prima I recommend this method 100%. If you like to paint in a glazing or layering method this might not work for you. I pretty much only used the solvent (Gamsol) for thinning the wash to tone the surface at the very beginning of the painting, and to clean my brushes, both while I was working and for clean up. As for thinning the paints, that's never really something I do, I always just use a touch of walnut oil to loosen them up a bit. Well apparently you can also use walnut oil to clean your brushes! (I didn't believe it was true until I tried it). Did you know they sell walnut oil in giant containers like this? To clean my brushes I just wipe the excess paint on a paper towel or rag, and then swish in the oil the same way that I would the solvent. It totally works! And as an added bonus the condition of my brushes has improved immensely since I started working this way. I haven't even been using soap and water afterwards like I usually did when cleaning with solvents. I also went through all of my oil colors (and there were a lot of them) and removed the colors that have potential toxicity (cadmiums, cobalts, ones with lead etc). I felt like I was in a chemistry class again, there was some very dense paperwork to go through. 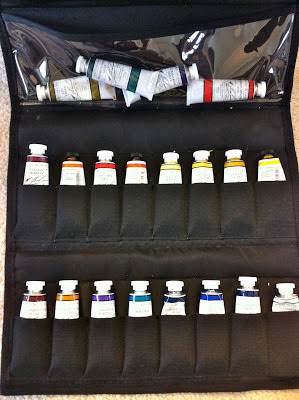 And now all my paints (mostly M. Graham) fit in my sweet little carrier. I like the M. Graham brand since they use walnut oil as the binder. So why this sudden-ish concern for health? 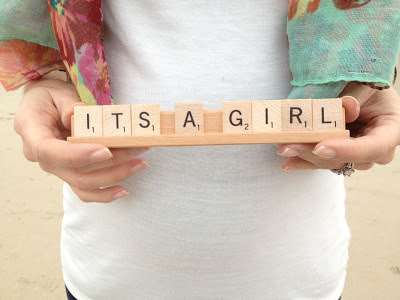 Well one reason is because my new studio isn't as easily ventilated as my last one, and the other (more important) reason is that we're expecting a little one in June! :) and guess what?